We, the Filipino youth and students of Anakbayan New Jersey, stand in solidarity with the people of Ferguson and New York City. 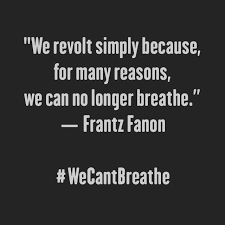 We strongly condemn to the highest level the no indictment verdicts in light of the murder of our fellow youth of color, Michael Brown on August 9, 2014, and father, Eric Garner on July 17, 2014. Darren Wilson, a white police officer fired twelve rounds at unarmed, 18 year old, Michael Brown, who had his arms up upon death. Eric Garner, 43 year old father of six, was put into a chokehold by Daniel Pantaleo, another white police officer. This resulted in Garner’s eventual death as well. With our fellow youth, and fathers being killed, how much more can our communities take? How many more times will we allow this to happen? As oppressed youth, we must hold Darren Wilson, Daniel Pantaleo, and the countless others accountable for their actions. And if this fails, we must demand a system that will. It is unacceptable that the justice system so blatantly disregards the lives of marginalized peoples. Black and Brown bodies across the country are being targeted and terrorized by police brutality and increased militarization of neighborhoods and communities. These generally unarmed, Black young men are being told every 28 hours that their lives do not matter and our justice system will not advocate for them. The list of the victims of police brutality will only continue to grow if we do not reclaim our basic right to livelihood. Our people share a legacy of loss. Freddie Ligiw, a youth member and organizer with Anakbayan in the Abra province, was forcibly taken on February 19, 2014. He dared to question societal order and fight for a better future for his people. In response, the Philippine government killed him, adding to the ever-increasing number of extrajudicial killings. We must end this culture of impunity worldwide. By 2050 there will be a white minority in the U.S. We will reach a point of history where most people in the country, at that point the people of color majority, are socialized to not trust the people meant to protect them: the police. As youth of color, and the future majority, we are not taught by the oppressive system that it will oppress. Rather, our people’s struggles and the stories we witness on the streets have taught us to reject the fallacy of security that is the police state. Do not blame us for wanting to protect the lives of our children as well. During a student walkout this past week, the squadrons of police brought out a Long Range Acoustic Device (LRAD), which sends painful shock waves throughout the body. This is how our “public servants” respond to a peaceful protest comprised of mostly high school students. Despite these attempts at intimidation and state repression, we cannot afford to remain silent. The criminalization of youth is sadly familiar to our collective communities. Whether on domestic soil or in the militarized state of the Philippines, our bodies are being policed and brutalized. As youth, we must reject this fascist government we have inherited and respond in rage. Anakbayan New Jersey calls on all youth to demand a system that advocates for its people and protects the marginalized. We must pursue an organized and collective struggle to liberate all of our peoples. Filipinos in the U.S. and in our homeland must raise their voices against the injustices committed against our allied communities. We must stand together and claim a better world and future for ourselves, or we will watch each of us fall. Our hands are up, but in fists, fighting for our right to breathe. From New Jersey to Mexico New York to Palestine to Ferguson to the Philippines, no justice, no peace! Black lives matter! Brown lives matter! Long live international solidarity! New York City, NY – Filipino-Americans join the biggest protest to date this Saturday in response to the non-indictment of police officer Darren Wilson involved in the shooting of African-American teen Mike Brown in Ferguson, Missouri and Daniel Pantaleo in the chokehold killing of 43 year old Eric Garner in Staten Island, New York. The protest started at Cooper Union. The contingent then marched towards Washington Square Park to merge with an even bigger march. Estimates say 50 to 60 thousand protesters took to the streets chanting “Black lives matter”, “I can’t breathe”, and “Fist up, fight back!” This is only one of the many demonstrations happening as part of “Million March Day of Anger”. “We, as Filipino-American youth and students, stand in solidarity with the families of Mike Brown, Eric Garner and everyone who has lost loved ones as a result of state-sanctioned violence. We join because an injury to one is an injury to all. We condemn the state violence against communities of color and the culture of impunity that breeds Darren Wilsons and Daniel Pantaleos,” said Chrissi Fabro, Chairperson of Anakbayan New York. According to the young activists, this experience is not far from the experiences of Filipinos. “The killings of people of color and impunity that is prevalent in the United States resembles the killings of community leaders and activists and the culture of impunity that allows perpetrators off the hook in the Philippines,” Fabro added. She pointed out that 204 cases of extrajudicial killings of activists remain unsolved under the Aquino administration, while those responsible for these human rights violations continue to walk free. On the other hand, Anakbayan is also calling on Filipino American youth to reflect and challenge existing “anti-Black racism” within the Filipino community. “We recognize that anti-Black racism has permeated even our own community. We acknowledge that this is a product of centuries of Western colonialism and assimilation to American culture that brainwashes us to be ashamed of our beautiful, brown skin,” said Joelle Eliza Lingat, Chairperson of Anakbayan New Jersey. Anakbayan activists challenge Filipinos to play an active role in what they call as the “new” civil rights movement in the United States. “Every 28 hours a Black person is shot by the police. We challenge Filipinos, especially youth and students, to stand in solidarity with our Black brothers and sisters by being agents of change in our own community. We must actively challenge racism and prejudices against other oppressed peoples,” said Lingat. “Let’s conduct discussions, dialogues and fora to educate ourselves and our community about the evils of racism and its systemic roots. We must do more than just show up, but actively uphold the demands of Black leaders, especially queer and trans* women, and participate in the various protests that are sweeping the country,” Lingat concluded. Anakbayan is a national youth and student organization working to educate, organize and mobilize the Filipino community to address important issues that affect Filipinos in the US and the Philippines. It has 11 chapters in major cities in the United States.